Chandra Shekhar Azad University of Agriculture & Technology has disseminated CSAUAT Recruitment Notice. There are Guest Faculty posts to be filled by eligible & work oriented aspirants. You need to visit www.casuk.ac.in to apply for Faculty jobs in Kanpur. Closing date to submit application form for CSAUAT Recruitment 2018 is 12-10-2018. Applicants may submit their application form at address provided below. After closing date, no form will be accepted. Those who possess Master Degree in relevant discipline may enroll for CSAUAT Guest Faculty Recruitment. Read all terms & conditions carefully prior applying for CSA University of Agriculture and Technology Recruitment. 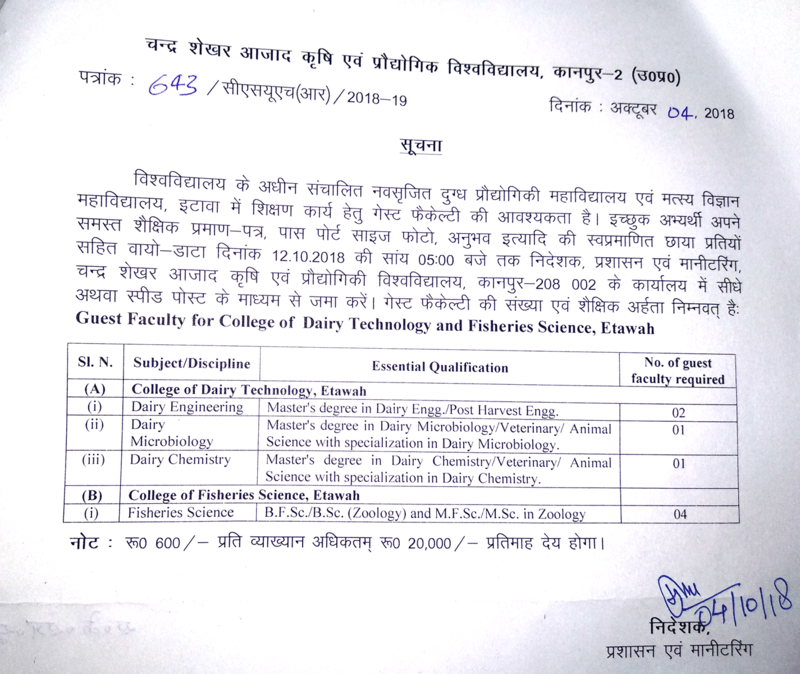 02 Master degree in dairy Engg/Post harvest engg. Prior applying for Chandra Shekhar Azad University of Agriculture & Technology Guest Faculty Recruitment, you must fulfill eligibility norms. Age of applicant applying for CSAUAT Jobs must exceed 18 years. Those who belong to reserved category will get relaxation in age as per government norms. Those appointed for CSAUAT Guest Faculty Recruitment will get Rs.20,000/- as pay amount. Along with this, you will get other allowances based on your performance in organization. Test or interview will be organized to appoint contenders for Chandra Shekhar Azad University of Agriculture & Technology Kanpur Guest Faculty Recruitment. You may present well in it to get hired for CSAUAT Faculty Recruitment. Process to apply for CSAUAT Notification is provided here. Applicants may move under ‘Recruitment/Tender’ head to enroll for CSAUAT Kanpur Guest Faculty Recruitment. From there, hit on ‘Recruitment for Dairy Technology & Fisheries Science’ link. It’s time to read all details from job notification. Eligible applicants may download their CSAUAT Application Form 2018. Then, fill all details in Chandra Shekhar Azad University of Agriculture & Technology Recruitment Application Form. Now, attach all required documents along with form. To apply successfully for Chandra Shekhar Azad University of Agriculture & Technology Recruitment, you must form at address placed below. To grasp more details concerning CSAUAT Recruitment 2018-19, you may visit its Official Link. If you face any sort of query about it, ask in below provided comment box.